Some farmers are blessed with naturally healthy soil and they need not change the composition of the soil before they start their organic farming. There are others, though, that will have to make their soil healthy first before growing anything in it. If your soil has too much clay in it, is too sandy, too stony, or too acidic, don’t despair. Once you understand the components of healthy soil, it won’t be too difficult to turn poor soil into a plant-friendly soil. You must understand the composition of a soil: it is filled with weathered rock and organic matter, water, and air. The most important component, however, is the organisms that thrive there such as small animals, worms, insects, and microbes. You will know if you have healthy soil because these organisms flourish when the soil elements are in balance. Minerals define the texture of your soil. Half of your soil is composed of broken down pieces of weathered rocks. Large particles are called sand. Medium-sized particles are called silt, and small particles are called clay. The proportion of sand, silt, and clay determine the texture of your soil and it also affects the drainage and nutrient availability. Organic matter refers to partially decomposed remains of soil organisms such as lichens and mosses, grasses and leaves, trees, and other kinds of vegetative matter. It makes up about 5 to 10 percent of the soil but it is absolutely essential to the health of the soil. It binds organic soil particles together, retains moisture, absorbs nutrients, and acts as food for microorganisms and other forms of life. You can add organic matter to your soil by adding compost, aged animal manure, green manure, mulches, and peat moss. Concentrate on boosting the organic matter of the first six inches of your soil because this is where much of the growing will happen. 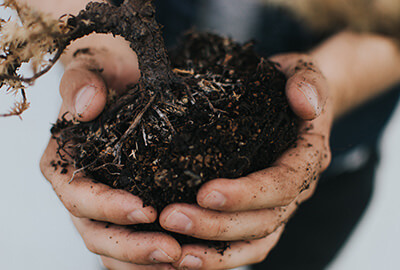 Soil organisms are the bacteria and fungi, protozoa and nematodes, mites, springtails, earthworms, and other tiny creatures that live in the soil. These are essential to help the plants grow and they convert organic matter and soil minerals into vitamins, hormones, disease-suppressing compounds, and nutrients that your plants need to grow. Healthy soil is composed of 25 percent air and 25 percent water. Water and air are held in the pore spaces between soil particles. Air must be able to penetrate between the soil particles or crumbs although too much air can cause the organic matter to decompose quickly. To make sure that there is a balances supply of air in your soil, avoid stepping in the growing beds or compacting the soil with heavy equipment.